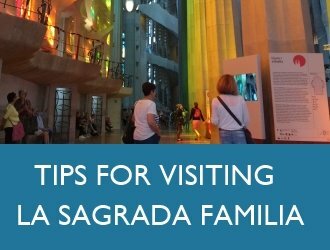 The “Festa Mayor de la Sagrada Familia” (festival of the Sagrada Familia district) started this weekend. 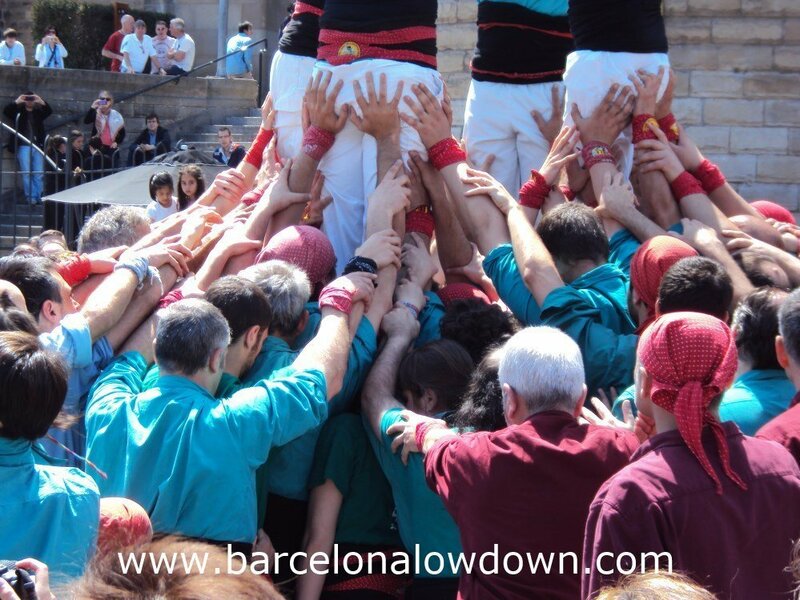 The festival lasts from the 19th of April until the 6th of May and kicked off with a display of human towers called castells in front of the Sagrada Familia Basilica. 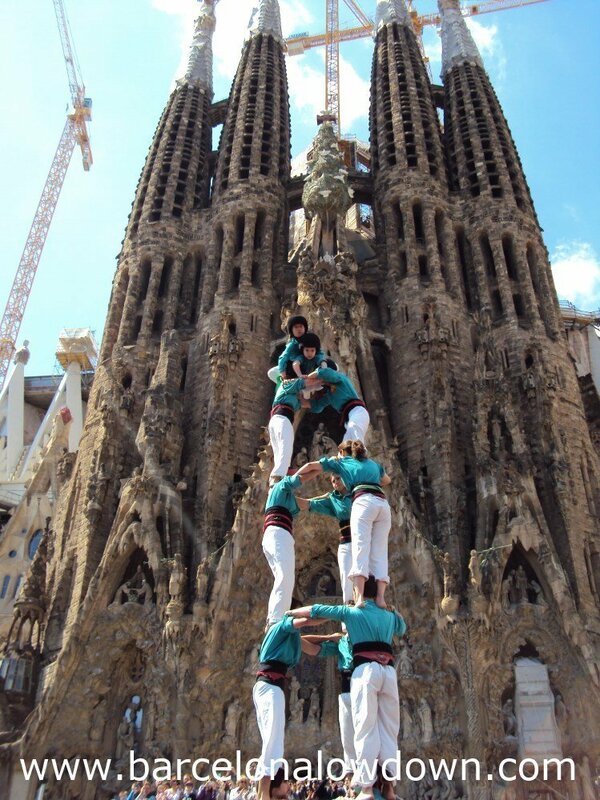 Castells are built by teams called colles who perform at festivals and competitions throughout the year. 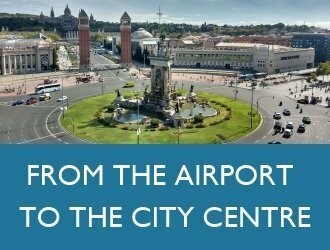 The tower is made up of layers, the first of which is called the pinya and is both the tower’s base and a kind of human safety net. Subsequent layers then clamber up over each other until finally a small girl (called la enxaneta) climbs up to top the tower. 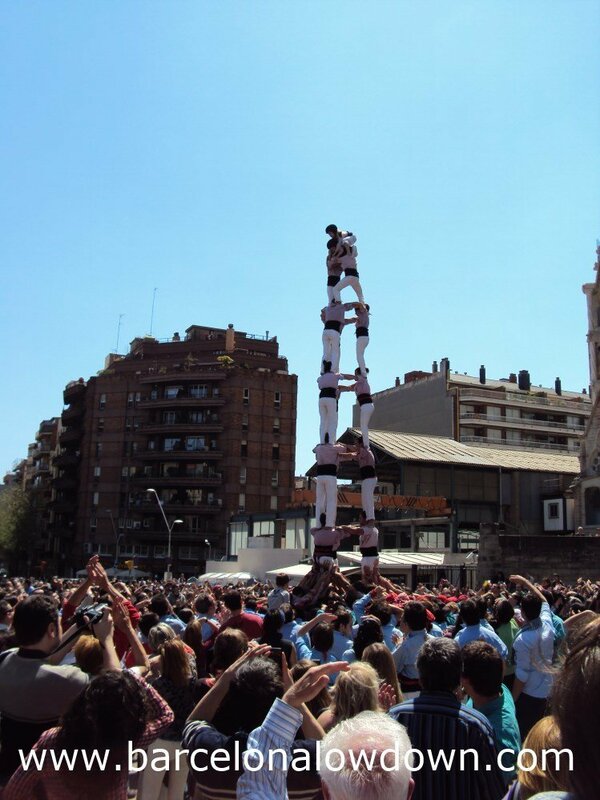 Castells are normally between 5 and 8 layers high. It all sounds incredibly dangerous, but the teams are well coordinated so that even when a tower collapses it happens in a controlled manner. 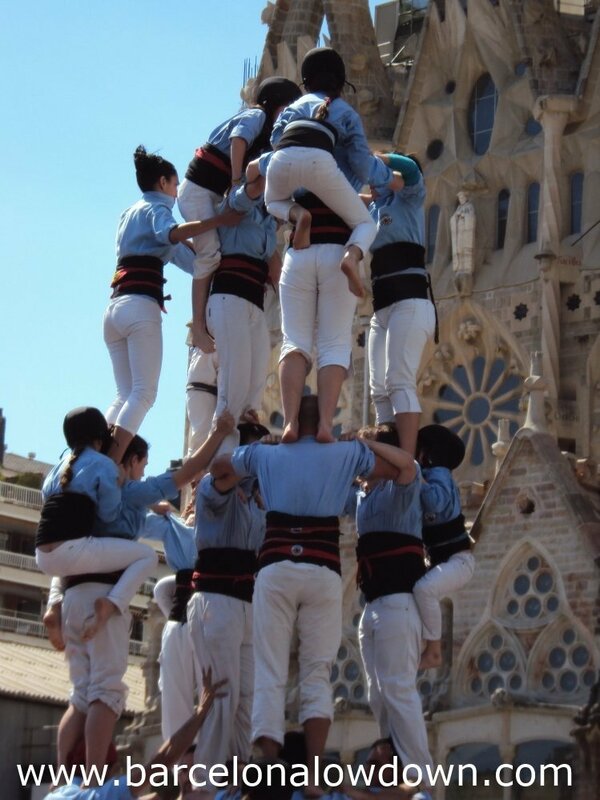 Even so, it can be pretty nerve wracking when you see a tower start to tremble as the castellers fight to maintain their balance. 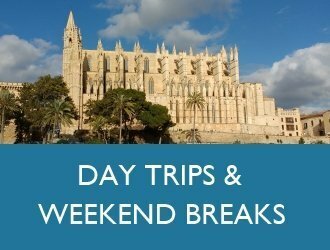 This weekend there were four colles from Sagrada Familia, Poble Sec, Granollers and Terrassa. 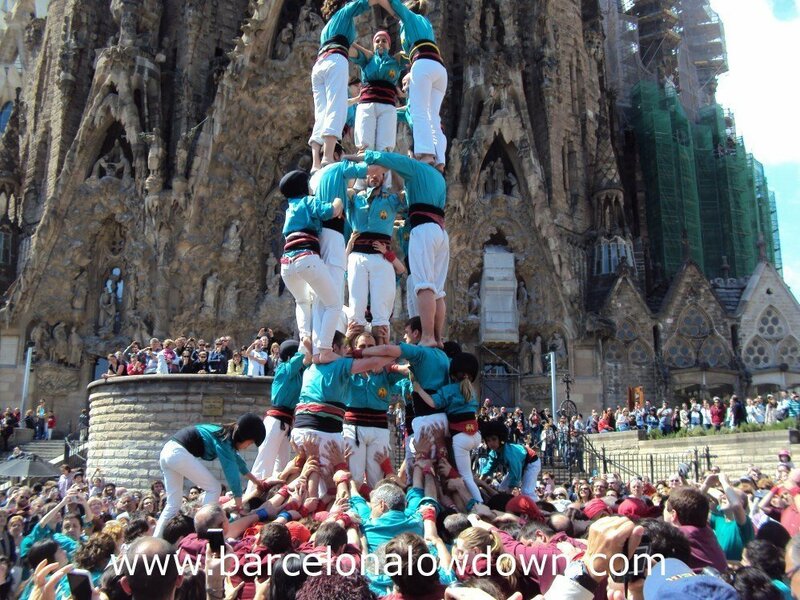 Between them they performed a total of 12 towers of different configurations. Most had 7 layers with between two and five people per layer. 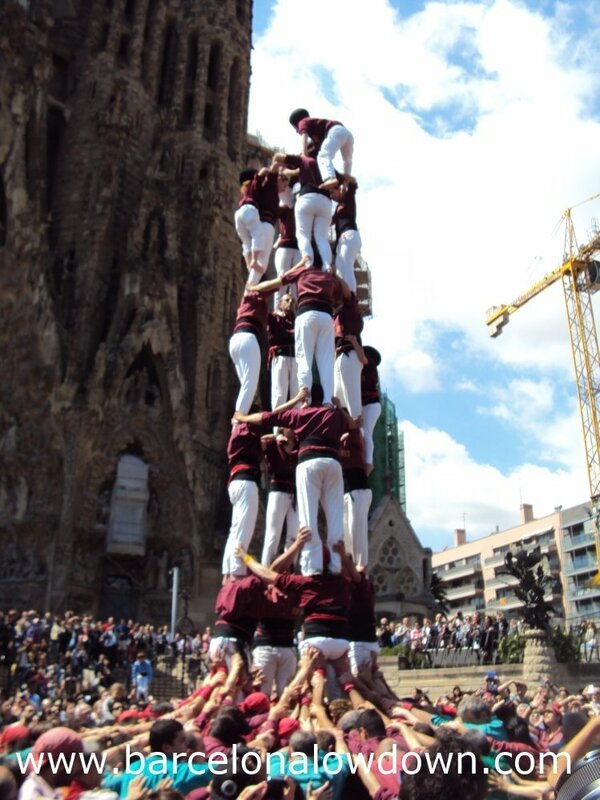 The first tower was unusual because it was pushed up from the base. There was one worrying moment when a tower collapsed. But, as far as I could see, no-one got seriously hurt. Thanks for stopping by and for pointing out your website…. What a great idea!! 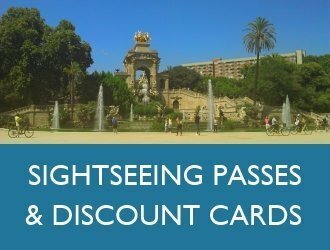 I’d be interested to know more about exactly what’s on offer in the Castellers Backstage Access package, do you get to be part of a tower? nice web :-) only a small correction if I may do it…the child in the top is called “enxaneta”, the enxaneta could be a boy or a girl, but usually are girls because they are more light and girls usually concetrate better…”canalla” is a catalan world that can be traslated as “children”, in casteller’s argot it’s refers to the 3 last layers of a castell: the “dosos”, the “acotxador” and the “enxaneta”. Thanks for your comment and for taking time to point out the error, I’ve updated the post accordingly. 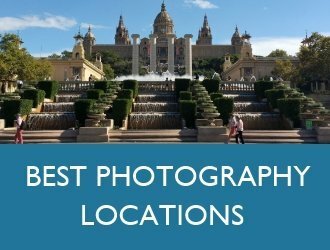 I’m glad you like my blog, I found out about The Vampire of the Raval totally by chance while researching a different article a few months ago and thought it would be an ideal post for Halloween!